Kathy Trotter was getting ready in the master bathroom when what she called a “significant event” occurred in November 2016 at the Delaware quarry on Section Line Road. “The house shook in such a way that I felt like I was going to fall over,” the Lehner Woods resident said. She said the blast at the National Lime & Stone Co. quarry was more like a “bombing.” The quarry is located at 2406 S. Section Line Road. The Trotters knew about the existence of the quarry before they purchased their home in August 2014. They originally lived for 15 years at the Lantern Chase subdivision, a mile farther away from their current home. At that time, they often heard noise from the quarry once in awhile, Trotter said. But her former neighbors have also noticed more activity than before, Trotter said. “They are significantly louder, shakier, and more common than they use to be,” she said. The couple, who have been married for 40 years, had planned to make money off their new home when they retire in the next few years. But Trotter and her husband believe the quarry has negatively impacted their 3-year-old dwelling. Trotter said the screens no longer fit in the windows and that neighbors have reported issues with doors and windows not closing properly. The Trotters have owned homes ranging from brand new to century-old and “everything in between,” she said. But they never seen the kind of wear and tear issues that exist at their newest home. Other residents who live near the quarry have voiced concerns on the private social media site, Nextdoor, about the blasting’s impact on their properties. They have blamed it for some of the cracks in their driveways, walls, and foundations. Trotter’s brother Eric Kaster, a Troy Farms resident, has experienced the blasts and windows shaking at his 14-year-old home he purchased last year. “This is as every bit as intense as any earthquake I’ve been through,” Kaster said, recalling his time living in Los Angeles. He formed a group of neighbors that want to resolve the issues they’re facing. “The intent of our group is not to close the quarry,” Kaster said. Instead, they want restitution for the suspected damage done to their homes and for the quarry to reduce the intensity of the blasts to levels below state regulations. Ohio prohibits ground vibration to exceed 1 inch per second and air blasts to exceed 133 decibels. Kaster said the November blast was within the legal limits based on discussions he had with the National Lime & Stone Co., which did not respond to The Gazette’s request for comment. The mining activity at the quarry started in the late 1800s before the Findlay-based company purchased the quarry in 1946, said Eric Heis, a spokesman for the Ohio Department of Natural Resources. But according to the National Lime & Stone Co.’s website, it acquired the quarry in 1961. Kaster believes his property — including his driveway and foundation — has accumulated damage over time due to the blasting. He believes that’s why the the previous owner of his home put nails in most of the house’s door frames to prevent wear and tear. So far, Kaster’s costs have been minimal by fixing cracks in the house’s foundation. But if he has to replace his driveway it would cost about $8,000, he said. “We’re hoping to connect the science behind what we feel might be the accumulative effects to the ground space around our homes; doing a geology survey,” Kaster said. The group has hit a wall with the quarry and ODNR because a scientific connection between the blasts and the suspected damage to the houses has not been established. State regulations are based on more than 35 years worth of research on the effects of blast-induced ground vibration and air blasts on residential structures. The United States Bureau of Mines published its recommendations for quarry blasting in 1980 after researching the issue since 1960. The bureau’s research on the effects of blasting on residential structures continued until the U.S. Congress disbanded it in 1995. But the additional research over a 15-year period continued to support the original recommendations. Ohio adopted the federal Office of Surface Mining’s modified limits of those recommendations in 1983 and expanded them to quarries in 2002. In addition, research published in 1984 indicated that human activity and changes in temperature and humidity can cause strains in the walls of wood-frame houses equivalent to those produced by ground motions of up to 1.2 inches per second above common regulatory limits, Heis said. But when an entire house is mechanically shaken — after being pre-stressed by 587 mine blasts — the first crack appeared after 56,000 cycles, the equivalent of 28 years of shaking by blast-generated ground motions of 0.5 inches per sec twice a day, he added. “The Delaware quarry typically blasts only once or twice a week for about 10 months of a year. Such infrequent blasting, combined with the existing vibration limits, should protect dwellings that are closest to the quarry from the effects of repeated blasting,” Heis said. For distances over a mile, the effects of repeated blasting are not considered an issue because the vibration levels are too small, but enough for people to feel them and be concerned, he said. ODNR requires yearly inspections for quarries. But Heis said inspectors strive for quarterly inspections. “If there are any complaints, reports, or issues at the quarry, then inspections increase. I was told we will send an inspector to a site ASAP after even one complaint,” he said. In 2016, ODNR conducted 1,866 mine-site inspections, including 36 triggered by formal complaints. Quarries, including Delaware’s, retain an “independent blasting seismology firm” to record all blasts at two or three locations around the site, Heis said. “If the quarry receives a complaint, it will typically attempt to record at least a few blasts at the complainant’s property, as well,” he said. 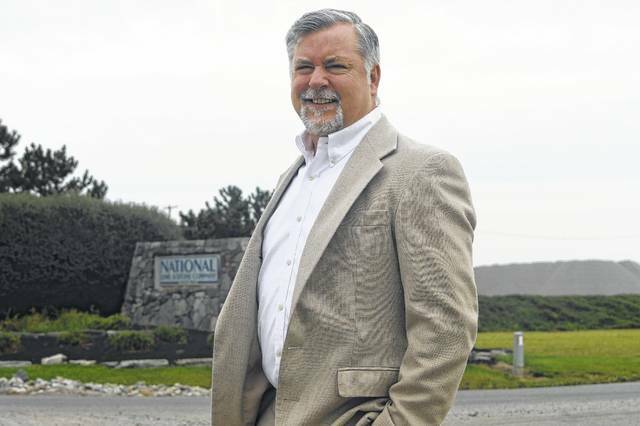 Vibra-Tech Inc. is the Delaware quarry’s seismology firm. It did testing at Kaster’s property during two scheduled blasts after he made a complaint to ODNR in November. Kaster said he was present for one of the two testings. But he didn’t hear any blast or feel any shaking during that session. But Kaster said such tests are cost prohibitive. A single one is about $1,000 and the group would need at least three for an accurate reading. He would like more people to actively join the group to help offset the costs for the tests. The group has about 16 members, representing eight families. Kaster can be reached at ekaster@tampabay.rr.com. Eric Kaster of Troy Farms subdivsion poses in front of the quarry owned National Lime & Stone Co., 2406 S. Section Line Road, in Delaware. Kaster is among residents in subdivisions located within three miles of the quarry who have voiced concerns about the blasting at the quarry. He believes the activity was too intense last fall. He also suspects blasting affects properties over a period of time.